That is what I said in my head today after I finished my "magic mile" time. Two weeks ago, I cut four seconds off my time and I was mildly excited. 8:48 to 8:44. Really, four seconds is nothing to get your Under Armor in a bunch. Frankly, I was kind of disappointed. The training schedule today said it was magic mile time. I was almost apprehensive. What would I get today? 8:40? Warm up mile. Stretch. Go. I felt great. I was really pushing it. Mile over. Check my time. 8 minutes! Are you serious? Is it possible I cut 44 seconds in two weeks? Needless to say, I was a bit ecstatic. Not only did I have an incredible runner's high from practically sprinting for a mile, (a slow sprint) but 44 seconds? At 4 miles, it turned into a nightmare...I could hear a barrage of cameras snapping. The race director, Will Cloney, stepped into my path to shake a menacing finger at me. I side stepped him. Then I heard quick scrabbling steps behind me and turned as a ferocious Semple grabbed me by the shirt and shoulders, spun me around and screamed, "Get the hell out of my race and give me those numbers!" For a second, I was paralyzed with fear, embarrassed beyond words. Arnie tried to pull Jock away, saying, "She's okay; I've trained her," but Jock was like a terrier, clenching my shirt. "Stay out of this Arnie!" There was a flash in my peripheral vision, then a crunch. Big Tom [Katherine's boyfriend] hit Jock with a flying shoulder block and sent him through the air. There was another thump when he landed. Now I was truly frightened. A wide-eyed Arnie shouted, "Run like hell!" 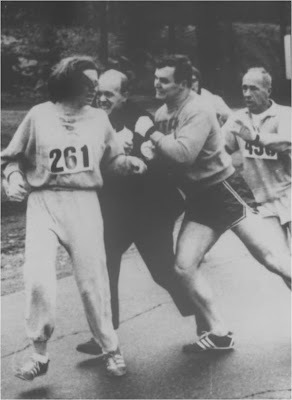 and away we ran, cursing and crying..."
So maybe it was Katherine's image of defying ignorance over 40 years ago, helping to set the scene for women to compete whenever where ever they wanted. Literally blazing trails of equality in women's sports. Maybe it was this image that spurned me on. I know 8 minutes isn't the fastest mile around. But today, for now, I did run like hell. More on this race hero, click here.